Honestly, I don't know what to make of it. I almost want to make the cog1 version into some archive page for the old workbench-crafting system. I'm really don't think it's different enough from it to warrant that, though. Bumping this (though maybe the thread title can get an update?). I redid the job menu to make it look more like the in-game one here, but not sure if I should go ahead and replace it or if people have feedback on how it looks or if it should be updated. Also, is there any interest in possibly splitting the changelog up from one huge page to a handful of subpages based on years? Might also be neat to put the last few entries on the main page. That looks great! Better than the current layout. Far better looking but whats with the space between research and engineering? 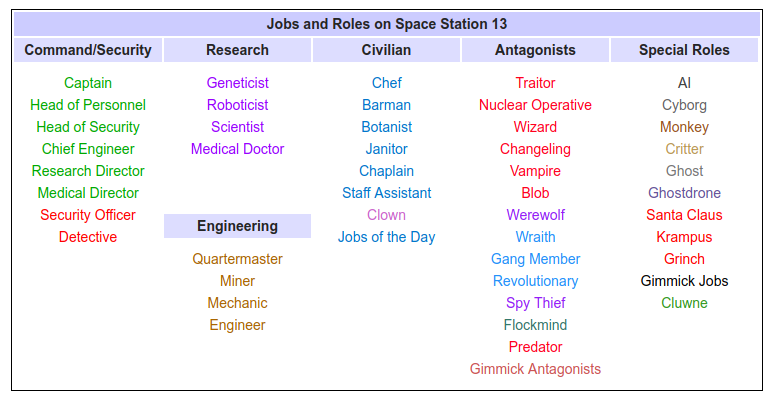 I've been considering moving the "Antagonists" list to being horizontal like the current one, and putting Engineering in its own column again. Let me see if I can make a quick mockup. Maybe try to make flockmind a bit more teal since they are very teal birbs. The clown should be comic-sans. I like it. It has a great balance and neatness to it. The bars and black border give it a solid sense of enclosure, like everything is in its right place. I'm personally meh on the changelog on the main page idea. Might be useful for people who are new/people are returning to the game to catch up on things. I make an effort to check it everyday, so maybe I'm not the target audience. You're welcome to reorganize it or some such; I don't care. How would you feel studenterhue if I organize certain massive lists into tabular form? Is an example of the tabular form I'm talking about. Is an example of a looooooong list. I feel if your using Ctrl+f to find something then somethings gone wrong. This is a result of time and the introduction of features obscuring info. At one time syndicate items was most definitely a shorter list. Another example would be the food and drink page, who also at one point was fine but then came a ton of cocktails and additional ingredients. I've gotten used to using ctrl f on them and don't really mind, but I can see why you think it's problematic. I've seen more than a few newbies look at the foods and drinks page and be discouraged by how many recipes they think they have to memorize. If I was a newbie chef, I wouldn't get a good idea of what I could make from that huge table because I'd be so overwhelmed, and the "main course" title doesn't say much either, unless I had something specific in mind to search for. In contrast, tgstation's version of our page is very intuitively organized, you can tell from the section titles what you can make, and the tables are much smaller, so while there are more recipes, it's easier to digest them. As for Syndicate Items, I'll admit even I'm overwhelmed by its length. When new traitor items, I just an entry onto the end of it rather than put with it with items with similar traits. I would love some sort of reformatting in general. Even with the smaller than normal font and description taking up almost half the table width, you still get big ugly chunks of text to sift through. I'd particularly be interested in a new format that looks less half-assed than the class crates table. How exactly are you going to put them into tabs? Because I'm not sure if a bunch of tabs would be more helpful. Tabs hide content and make it harder to search (since ctrl-f generally doesn't find hidden content). I'll experiment with some redesigns of the page later. I see your point. Avoid tabular, but split the tables up so you can quickly access it via the contents list up top? * Not available for nuke ops. Only for the most moustache-twirling of evildoers. It's a grenade that affixes a Fake Moustache to everyone in range. Fun and twirly for the whole family! That way, there's a quick ref at the top for what items are usable and by who, and then a detailed list at the bottom. The table's listings would link to the item headings, of course.